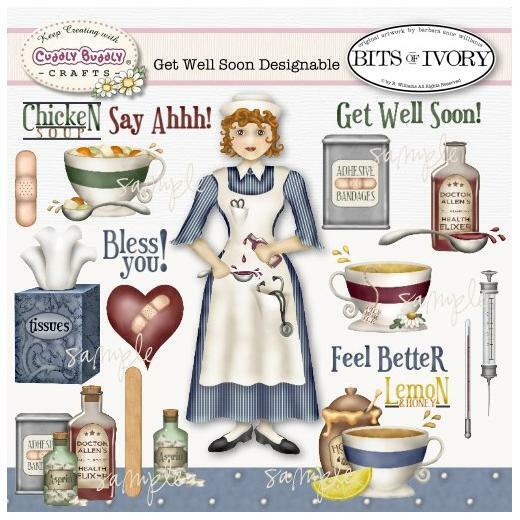 Get Well Soon by Barbara Anne Williams is a set of 20 images including word art, plus a bonus 8x8 background that can be tiled or resized. You'll find a friendly nurse, medicine, bandaids, an old fashioned hypodermic needle and thermometer, tissues, etc. Some of our favorite home remedies from childhood have been included as well - chicken soup, honey-lemon water and chamomile tea. Perfect for projects you're making for friends and family who are feeling a bit under the weather, or for a special thank you for a nurse or other health care professional, these images are ideal for scrapbooking in addition to crafting and card making. The images are all 300 dpi PNG files and the background is 8 x 8, 300 dpi JPG. Images © Barbara Anne Williams, 2009.